View of “Yve Laris Cohen,” 2016. At Yve Laris Cohen’s opening, people milled about carefully, minding the edges of the movers’ blankets on the floor. Like protective islands, they marked off space for their storied cargo—the disassembled set for Martha Graham’s 1958 dance Embattled Garden (which is this show’s title, too). The striking biomorphic décor—a floating harlequin-patterned platform and a stylized twelve-foot-tall tree, designed by Isamu Noguchi—was displayed with forensic elegance, like puzzle pieces. Or like wreckage: When the Hudson River flooded the far West Village during Hurricane Sandy, the Martha Graham Dance Company’s theatrical property, housed in the basement of the historic Westbeth complex, was among its art-world casualties. For his “Embattled Garden,” Laris Cohen, an artist with a background in dance and a part-time job as a production assistant for the company, is replicating the water-damaged set. Each day the gallery is open, for five weeks, he’ll clock in to construct a sanctioned knock-off. This poetic, unfolding gesture of institutional critique—or something like it—collapses the role of the artist who renews the institution through a torch-bearing of ideology and craft with that of the wage laborer who rebuilds and maintains it materially. The collapse isn’t contrived, though; it’s one that occurs in real life all the time. 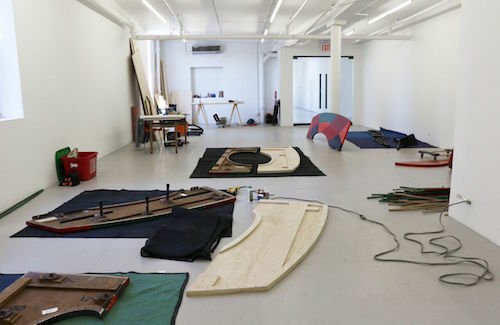 Hooking viewers with the mystique of local avant-garde history, and the fascinating unofficial provenances of its beautiful artifacts, Laris Cohen makes visible the complicated tradition of artists daylighting in the arts—as installers, stagehands, studio assistants, and gallery attendants. A few days after the opening, I found the artist working at a long table, laptop open and a delivery of fresh wood leaning against the wall. Things had shifted only slightly in the gallery as a result of his low-key ongoing performance, but perhaps, in the spirit of Graham, there will be moments of dramatic tension. (Like when, as per Noguchi, he skewers the charming structures with colored rattan rods?) I’ll check back.